Pictured: The “30 Years” upgrades build on an impressive list of enhancements introduced with the GEN-F2 range. 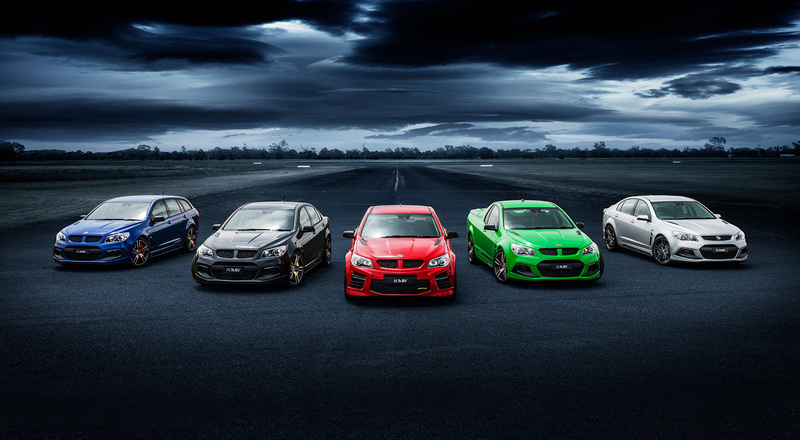 To celebrate its 30th year in operation, Australia’s leading performance car manufacturer, HSV, today released details of its “30 Years” anniversary range; part of the last MY17 range that will ever be built off the locally manufactured “Zeta” platform. Based on HSV’s GEN-F2 supercharged range and including popular models ClubSport R8 LSA, ClubSport R8 Tourer LSA, Maloo R8 LSA, Senator Signature and GTS, the “30 Years” upgrades build on an impressive list of enhancements introduced with the GEN-F2 range including revised suspensions, new front and rear fascias and side skirts, new bonnet vents and a range of new wheels. ClubSport R8 LSA, ClubSport R8 Tourer LSA, Maloo R8 LSA and Senator Signature all benefit from a power and torque upgrade of their 6.2 Litre Supercharged LSA Generation IV Alloy V8 engine to 410kW / 691Nm. The aural experience of all models in HSV’s “30 Years” range is boosted through modifications to its bi-modal exhaust system. Functionality in the chassis control module has enabled HSV engineers to recalibrate the exhaust valve control enabling it to open earlier in the “rev” range. This change is sure to please all HSV enthusiasts for whom the sound of an HSV V8 is almost as important as the performance it delivers. Styling of the “30 Years” range is also enhanced through the adoption of “matte black” accenting on the alloy wheels of the GTS and the three R8 LSA models, while HSV’s stylish 20” SV Rapier forged alloy wheel, until now optional across the GEN-F2 range, becomes standard on Senator Signature, further enhancing the model’s “luxury/performance” positioning. Available as an option for the first time, across the entire “30 Years” range, is a stylish, 5-spoke, 20” x 9” (front) and 20” x 10” (rear) SV Rimfire forged alloy wheel. Whilst ½ inch wider than the alloy wheels fitted to all the models in the “30 Years” range (the additional width improving tyre side-wall stiffness whilst cornering), the SV Rimfire wheel is also one of the lightest forged alloy wheels HSV has ever offered. Also available with the “30 Years” range will be HSV’s 6-piston brake package, until now fitted exclusively to its GTS model. This AP Racing brake package, featuring forged 6-piston brake calipers and 390mm (front) and 372mm (rear) discs, delivers world-class stopping power and will be available as a limited availability production option. Rounding off the changes to be introduced with the “30 Years” range is the availability of three new colours – “Spitfire”, a vibrant green, “Son of a Gun”, a gunmetal grey and “Light My Fire”, a metallic, burnt orange. Said HSV’s Managing Director, Tim Jackson, “The performance and styling enhancements we’ve introduced with the “30 Years” range, coupled with the adoption of exclusive “anniversary” content, are a tribute to five important models that have helped shape HSV. These vehicles are designed to enhance what is already a great value proposition, and we look forward to offering our loyal fans a unique opportunity to be part of our final range of the Zeta platform”. The company confirmed that production of its “30 Years” range had recently commenced, with the company reporting that its dealers had already taken significant pre-orders.